garment house: ravelry store pattern giveaway! I've decided to open a Garment House Ravelry Store for my pattern downloads, too! The same two patterns are available for download now. If you're a knitter and don't have Ravelry account, it's worth signing up. Especially if you're interested in getting one of my patterns for free! That's right, it's time for a party. As a way of saying thank you for the support, I'm giving away one pattern (of your choice) to ten random commenters on this post. TEN! If you're shy, or don't know what to comment, let me give you some ideas. Tell me what age you started knitting, who taught you to knit, or what knit item you saw that inspired you to learn. I'll give it a couple days (the promo codes expires next Friday), then I'll randomly generate some numbers and go through the comment list and try to contact you with a promo code for one free download. Please leave some way for me to reach you, have a blogger profile with a link to an email, or check back here and i'll leave a response to your comment if you're a winner. If there's no way to get a hold of you, i'll keep moving down the list. Let's get this commenting party started! I'm loving the new (and improved) patterns. Can't wait to see what else is coming!! Baby patterns? Great photos. Bravo on opening shop! I was around knitting as a child when my mom and her mom were together, so they taught me the basics. It wasn't until I fell in love with tiny seed stitch baby booties, pregnant with my second, that I picked up the needles and yarn and decided I too wanted to make things that could be passed down for generations like my mom and grandma had been making my whole life...like the sweaters I was putting on my first born that I had worn as a toddler. Suddenly it all made sense. Treasures. Beautiful photos and I love the patterns! My grandma taught me how to knit the summer I was 15, stuck at home with pneumonia while everyone else was off having adventures. My first project was a super long garter stitch scarf...in burgundy and gold stripes, just like the Gryffindor scarves from Harry Potter! That scarf is very special to me for so many reasons. I have admired your knitting since discovering your website a year or so ago. Your new shop for patterns is exciting and I am looking forward to seeing what you unveil. I do love the hot water bottle cozies...it is finally getting colder here and I think I may have to knit one of these soon! By the way, the sweater in the photo is lovely. Kim. I love your photography and sense of style. I am a embroiderer by trade but got knitting lessons for my 30th birthday earlier this year and I now pretty much want to knit every hour of every day. My tiny flat is like an igloo in winter and I always have at least two hot water bottles strapped to me at any given time so I would love to try out your cover pattern to make them better looking. Good for you for going for it! I'm so excited to see what else you have in the knitting pattern pipeline. Oh I'd love to win a pattern! I've been knitting for five years and yours is actually one of the first blogs I ever started reading about four years ago. I know I'm going to love your patterns. My childhood knitting lessons never made any sense until I became a weaver. Last year I sat down to learn socks no matter what, and now I'm unstoppable! Hot water bottles are a winter essential. Mine is still on it's peg under the sink, but as soon as the nights become chilly, I like it put it under the sheets just before I go to bed to get things warmed up. oh, i would love to win one of your beautiful patterns. All of your work is so inspiring, I am so happy you are doing super duper and wish you all the best for the last trimester. I learned knitting at school and started again to knit for our now 6month old son last year. We are definitely hot water bottle users in our house and your covers are beautiful! That's actually what I've loved about all of your stuff over the years...everything is simple, natural, and beautiful. I learned to knit when I was eleven from my grandmother who always has an afghan she made over her chairs or couch and has two drawers full of sweaters she has knit for herself over the years. And now, my 6 and 7 year old sons (yes,sons) want to learn how to knit so it seems as if the tradition will live on in my family. Thanks for all of your inspiration to make beautiful things! A friend in one of my childhood ballet classes taught me how to knit. Actually, she taught a whole group of us, but she and I were the only ones that stuck with it. Such sweet childhood memories. : ) I love your blog, the pictures are absolutely beautiful and inspiring!! Oh wow, thanks for the giveaway! I learned at Christmas time 2009--my mother taught me. Although she tried to teach me as a child, it wasn't until my late 20s that I finally got it. Now I knit during all of my free time! I'm happy to see your patterns on Ravelry. I'm glad to see that you are blogging again. I love your style and aesthetics, especially your knitted items! I love the natural palettes you use in your knitting. Congrats on your Ravelry store. I learned to knit when I was a newlywed, 20 years old. I wanted to make scarves... And it turned into a much bigger obsession than I thought it would! Hello Elly, love your blog! I learned how to knit at an after-school program when I was in 4th grade. I remember the first thing I made was a scarf, if you could call it that. It was so wonky! Congrats on the shop. Hi, Elly. So glad you are sharing your beautiful patterns. I learned to knit in my early twenties. I taught myself by reading a brochure. Funny now because I rely so much on online video tutorials now. I'm so glad you started your blog back up! I would love to win one of your patterns! I'm not sure if my last comment posted, so here goes again. I'm always inspired by your knits and I'm so excited that you're opening a ravelry shop! I started knitting in college to stay awake! Yeah! This is exciting! Thanks for the chance to win!! Thank you for this giveaway! I discovered you on instagram last week and really like all your projects. About 10 years ago the mother of a friend taught a friend of mine and me to knit one type of scarf (in a sort of brioche stitch so that we only had to learn the knit stitch and in a sort of English method). It was a collaborative work, I would knit a stripe in one color and pass it to my friend, and she would do another stripe and so on (we didn't live far away). We didn't learn how to cast on, bind off nor weave in. The scarf (inspired by the first Harry Potter movie) was a Christmas present for another friend of us. I didn't touch the knitting needles again until around 10 months ago, when this same friend (the one who got the scarf) announced that she was pregnant. It was the first time one of my friends was having a baby and I thought it would be nice to knit her daughter something (it was the Berry Baby Hat). I bought a set of interchangeable circular needles and taught myself the continental, both western and combined, method, magic loop and everything else from the internet. After a couple of cowls and hats I am currently working on my very first top and learning as-I-go... and I love it! I am an expat and don't share this hobby with anyone I know / lives nearby so I am extremely grateful about all the information and patterns that one can find online. I started knitting 15 years ago, but I was self taught so I didn't actually start making things I like until about 10 years ago. My mother taught my sisters and me the basics when I was about 7, then my husband gave me a class for Christmas when I was about 21 - I've been self taught since and I love every minute! I learned to knit as a child, but became really obsessed about 7 or 8 years ago. The Wenlan Chia book - Twinkle Big City Knits actually got me back into knitting. It was so fashionable and well styled that it made me want to knit everything in it. Ultimately, I knit very little out of it, but it was wonderful inspiration! Then I found ravelry, and like many of us, that has turned me into a completely obsessed knitter. I can't imagine not having knitting in my life! It's the best! Welcome back and thanks for the opportunity to win one of your patterns. I'd like to knit up one of these for the winter season. I can't wait to see your patterns on Ravelry and will check them out - I learned to knit while living in Seattle, must have had something to do with the rain. Now that I live in MN, it is a great winter pastime. Lesa Bader (lesabader@yahoo.com). I'd love to knit your hot water bottle cover. Thank you for the opportunity to win a pattern! Oooh, I love to talk about knitting! I started knitting in college. I was 19. One of my roommates had learned from her mother the prior summer and came back to campus our sophomore year with yarn and needles. I was so intrigued! She taught me while we'd watch old SNL reruns on our couch. We'd make late night runs to the 24 hour Wal-Mart in the neighboring town to buy (now that I know!) truly gross acrylic yarns and make epic, long, huge scarves for everyone we knew. She no longer knits and never really knit past the scarf stage but I was instantly hooked and moved to sweaters almost immediately. When I studied abroad the next year the first thing I did was find a store that had knitting needles & yarn. And I've been knitting non-stop since. Next year is our 10 year college reunion! Now that I'm writing this I realize I owe my college roommate quite a bit for teaching me to knit. I should make her a sweater in thanks and give it to her at our reunion! Can't wait to knit up the hot water bottle cover! I've had designs on making one since you first posted about knitting one up ages ago (at that point I didn't have the necessary knitting skills - glad to say I do now!). Congrats on opening the shop! I learned to knit when I was very young - maybe 6 yrs old - and remember making a potholder. Then when I was 10 yrs old I learned to crochet and made a lot more items - kept it up for a few years and picked it up every so often. Then when I was around 20 I re-learned to knit properly and just self-taught. From there I knit like crazy and picked up crochet again, too. I haven't stopped since. Welcome back, and congrats on the shop! It made me smile to see the hot water bottle cover revamped ... I remember ogling your version many, many years ago and vowing to make my own. Obviously the universe is reminding me that it's never too late to get on that! ps. As the recipient of one of Kristien's many neckwarmers, thank you for the Pip Squeak Chapeau-inspired pattern long ago. I love that cowl, almost as much as I love the friend who made it for me. Oh, I love the hot water bottle cover. My kids would be in heaven with one of those each and I would enjoy the knit. I started knitting when I was about 12 years old. The first thing I knitter was a scarf and that quickly lead to a jumper (I'm in Australia so a sweater to you) and then some mittens and then I was hooked and I haven't put my needles down since. What I love most about knitting is the comfort of sitting with loved ones while I create something of beauty and for others (and me) to enjoy. I learnt to knit when I was 8, my mum taught me. I used to knit countless scarves for my teddies and I thought you could get holey knitting by simply stabbing the knitting needle into the knitting repeatedly. My technique is much better these days! The patterns are lovely! Would love to knit a hot water bottle cover for the winter. Hot water bottles are the BEST. When I was in grad school and living away from my boyfriend (now husband), I joked that he'd been replaced by my hot water bottle :) Been following for a while now, great to see you back! 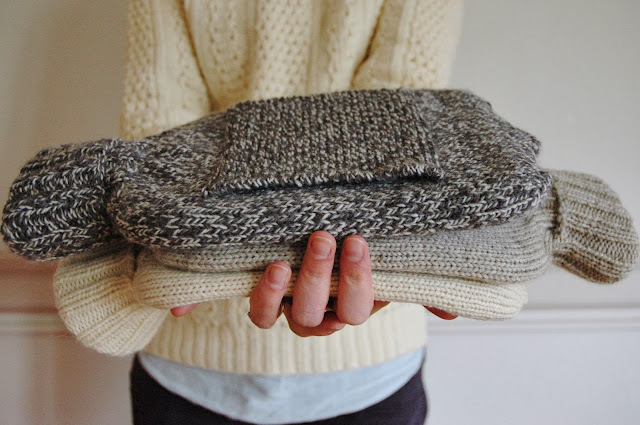 Love the style of your knits. I am so happy to see you back in this space - and congrats on the upcoming baby! I taught myself to knit when I was pregnant with my first child, about 7 years ago now. I still don't feel super confident as a knitter, but I do love it. Only the past two nights has it started to be a little cold here. I am thinking about getting a hot water bottle - I have never had one before - so I am very interested in your cover pattern. So great to hear you are doing well! Congratulations on your baby! Thank you for the chance to win one of your hot water bottle patterns. I first learned to knit in junior high school home economics class, plus some tips from my Grandmother. I don't remember what I made first, but my Mother still has some funny looking potholders I made out of red yarn. last minute entry! my gran loved hot water bottles, she had no central heating and kept two hot water bottles in each bed in the house. i made a screenprint about them; https://www.etsy.com/uk/listing/59194614/sale-blue-hot-water-bottle-sighs-art?ref=shop_home_active. my hot water bottle is cosy-less, would be good to knit it a sweater.